20-min walk from the train station, the Mercure St Malo Front de Mer hotel is located near the so-called cité corsaire (known for its history of privateering), vast Sillon beach and the Thalasso center. This hotel offers rooms with views over the sea equipped for working in complete tranquility. Some are also designed for families. For relaxation, treat yourself to a trip by boat to Guernsey. This Mercure hotel offers an invitation to explore - the Corsair City with its ramparts, the castle and its museum. 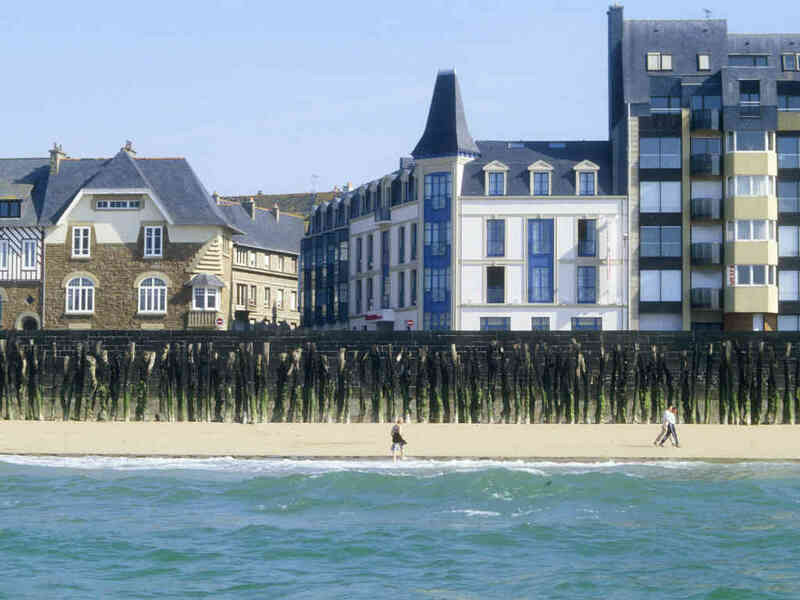 Saint Malo is also the departure point for cruises to the Emerald Coast, Jersey and Guernsey. Choose from different room categories: Standard or Privilege Room overlooking the sea, to take advantage of a wider range of services. The ideal place to relax and enjoy the sea views, room service until 10 pm. Great location for the ferry terminal, but parking near to the hotel difficult on arrival. Comfortable sea front hotel 15 minutes walk from walled city, 5 minutes from bus stop for everywhere else. Friendly, helpful reception. Comfortable room with all the basics including kettle for hot drinks. I felt at ease and slept well. The room is nice and clean, the water pressure in the shower is pure. The breakfast is great, except for the coffee. The see view is the best part. Excellent! Everything needed was supplied. Comfortable bed, yes and coffee, great bathroom. Friendly staff. A very enjoyable stay. As an Accor Platinum member for quite some time now I was not impressed with this hotel or its service. First time as a platinum member I didn’t get an upgraded room. Check in was not very friendly. Got given a tiny cramped inter connecting room and had to ask to move. Quite disappointing. Positive is it’s a good location. We thank you for your this point of view about your stay. But we don't understand why you are so disappointed. At your arrival, we have change your first room which was interconnecting for a quiet room. You seem agree. About the upgrade, it's only if we have avaibilities and it was a holidays period. Your's sincerely. The Hotel manager. Convenient,location .nice breakfast. Clean room.welcome was polite but cool. very good and the staff very helpful. We were only booked in for one night but due to a dockers strike we had to stay another night which was dealt with very quickly by the staff. We would like to mention the student helping Hugo very polite and spoke good English well done Hugo. Situated only a short walk from the walled city and right on the sea front. Wonderfully helpful, polite and friendly staff. The room and bathroom were very well appointed and clean and the chambermaid was very thorough. Although no private parking at this hotel, there was plenty of road parking (not that expensive and the pay machines had option for instructions in English) right outside. The bar had limited choices but sufficient for us. Breakfast had the usual good selections. Overall, highly recommended this hotel. We had wonderful service at the hotel. We were allowed to check in early and each one of our requests (e.g. for extra teabags and milk - being English!) was met cheerfully and promptly. Good night at Mercure Saint Malo located directly on the beach and only few minutes walk of the city center. Lovely bedroom with bath. Good breakfast especially the crepes! Extremely pleasant, very clean, considering the very strong winds, room was very quiet. Selection of food for breakfast was very good. We enjoyed our stay in the Ibis Styles St Malo. The only problem was that we had booked a sea view room. When we arrived we found that it had a bath with shower over. Due to arthritis I cannot easily access a bath and we asked to change to a room with a shower cubicle. This was quickly arranged although the room did not have a sea view. On departure we asked for a reduction in the room rate as a sea view room is about 20 Euros more per night than the room we were in. We were told this was not possible as the room was pre-paid. Slightly dissapointing result.